This week’s app review is pretty cool (aren’t they all, though?). 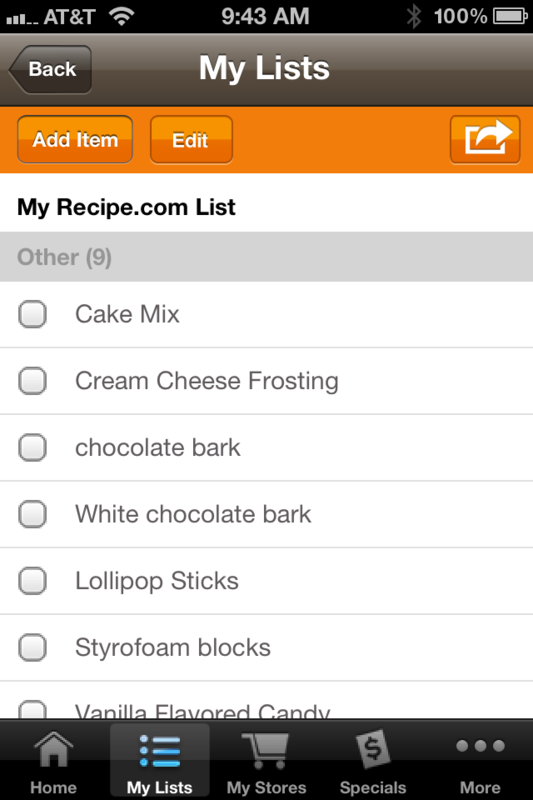 As you can tell by the title of the review, the app I’m reviewing is Shopping List (from Recipe.com). I had a lot of fun making my grocery list with this app last week and decided that any app that makes creating a grocery list a fun thing to do, should be highlighted in my weekly app reviews! Or it may just mean I need to get out more! Up until last week, my go to app for grocery shopping has been Grocery IQ. Grocery IQ is great for keeping my grocery shopping organized and has a ton of features, but sometimes is just more than I need. As you can see by the picture below, Shopping List, on the other hand, is quite simplistic. 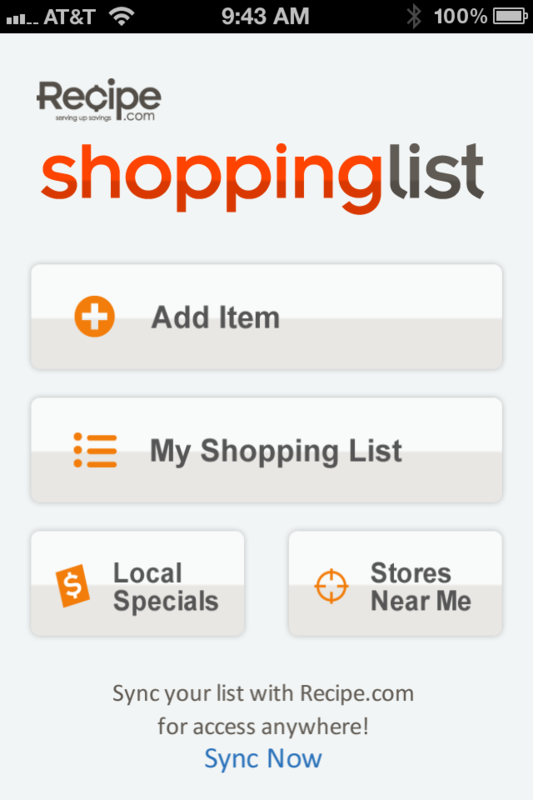 With Shopping List, you can start a new list, add items, check for specials, and find local stores. I still love Grocery IQ for its ability to keep me organized, but Shopping List is just more fun right now. That’s because the thing Shopping List has going for it that Grocery IQ doesn’t, is voice input. Its voice recognition is powered by Nuance (you don’t need to know their resume, but trust me, they’re the top of the heap in voice recognition) and I was completely amazed by the lack of errors when it made my list. I was adding some kind of obscure (for me) items to my list and it got every single one of them right. Here’s my list (I’m making cake pops for S-man’s birthday). I was most amazed when I said “styrofoam blocks” and it got that right! Really?!? It was pretty cool. Even better than cool, though, was how quick it made the process of creating my list. Also, I was able to use the “locate stores” option, choose the store I shop at most frequently, then organize my items/aisles the way I shop in that store. So, any cons? Unfortunately, yes, but not deal breakers for me (because the voice entry was fun enough to override what isn’t working well). The two things I felt need improving were entry by scanning and ability to create my own aisles. 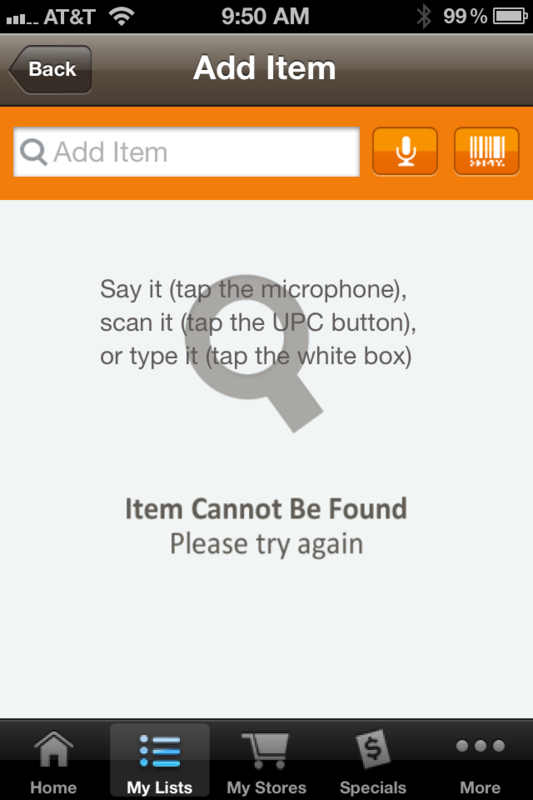 First, there is a scan entry option, but I tried on over 10 different items and couldn’t get it to find any of them. This is what I kept getting instead. Grocery IQ also has this ability, it works great, and is my favorite feature of that app. Second, there are a number of aisles included for organizing the shopping list (fruits, paper products, meats, etc. ), but no option to add or rename the aisles to more accurately represent the store you shop in. For example, I had a couple of items that I buy from the health food section, but that isn’t one of the aisles available. Again, this is a feature that I use and appreciate in Grocery IQ. Like I said, neither of these are deal breakers for me because I get such a kick out of making my list just by talking. However, if these two items were better, I’d be totally over the top about this app. My hope is that either Grocery IQ will add voice recognition or that Shopping List will improve it’s scanning feature and add the ability to edit aisles. I use and like this app. I only have one problem. Once I am finished with a list I have yet to figure out how to delete old lists. It bothered me so much I have not used this in a long while. To delete a list, you just go to the “My Lists” page, slide your finger across the list you want to delete, and a delete button will appear. Tap that and it’s gone. This is true with all lists but the default recipe.com list; I couldn’t get rid of that one. Gracias! You are a gift from heaven.